WHAT SHALL WE DO ABOUT OUR WORKERS? I like this our little letter-writing ritual. It makes me feel closer to you even though you are back now. So romantic. I am glad that you are eating and working again. It is such a relief to see the men who were queuing up to take over from you no longer hovering around. I know they are still there. They are lurking in the shadows peeping to see if you are really healthy or not. They should stay where they are because my love for you dear darling will never die. So, that man who shouts like he is still a Student Union leader and brags about his many cars and fancy motorcycles, did you hear what they are saying about him? You know he came and told us that he has seven degrees and all. Ashe, even the Harvard he said he went to it was just a one week course that he paid plenty money to do. Anyone with money can pay to do those one week things where they give you a certificate of attendance. Then they go to the Harvard shop and buy Harvard alumni stickers and put all over their cars to impress their many side chics. Because you know they can’t use it to impress their wives — their wives who probably helped them pack for one week know very well it is just a professional development course and not a degree. In fact they are saying he probably graduated with a third class. My dear we both know that this doesn’t matter. You may not have gone to university but you are my leader and love. I don't even care if you don't have a school leaving certificate. The man does not know it is not by having fake Harvard alumni stickers that you become succesful. The man does not grow up. He is still the same political hustler that he was as a student union hustler. But he is not very smart. He is always the one in front fighting other people’s dirty wars. He is like a high class thug for hire. But they say that the chicken that likes to be the first to show up will likely be the first to enter the pot of soup. So, my dear how far? It is not that I want to annoy you, but that grass cutter is still parading by my window every morning, whistling as he washes your car, singing hymns and worship songs as if he is not a thief. I really think we should take care of this guy once and for all. Think of my nerves and peace of mind. Don't let a thief spend so much time in our house. Like I keep saying, our other workers will think they too can steal our money in the name of cutting grass. Please darling. Let us let him go. There is this serious thing I have been meaning to talk about. You remember how the boys we sent to guard our farm in Rann went and mistakenly killed people? You know we have not visited Rann yet to apologize? And our boys who made the mistake are still driving around town like nothing happened. We can’t just mistakenly kill people’s children and not do something about it. Especially when we show empathy when our white neighbours get hurt. It looks one kain. Please let us look into the matter again. We are not bad people. Those boys were just careless. If you ask me my dear, the way the workers fight amongst themselves, I feel like if someone wants to attack us from outside it will be easy. We can’t have our own workers sabotaging our progress because they are fighting among themselves. Our enemies are not organised. Those of them who are not at the police station facing charges of theft are running up and down to hide the money they stole. If anyone will bring us down it will be one of these oversabi workers we have or those who want to take your place or one of our own people who have been quietly stealing under our noses. Darling, can I ask a favor? I know you don't like him and all but I think he has suffered enough. The Sheikh whose children we have killed. I know he offended you by hitting your chest and all but ok, you have killed like five of his children. And he is going blind where he is locked up. I don't think there is anything left to prove. It doesn’t look good at all. Remember when we were building our house, we visited him and all, there are even photos of that short man who pretends to like you squatting in his room looking for support. I know it Is a difficult situation but maybe it is time to just let go. I know you are kind my darling. Let us let him go. Ehen, I forgot to ask, do you want one or two spoons of sugar in your fura? If you ask me, I think you should reduce sugar now that you are recovering. See you in the other room. I know you are back and I can just walk into the other room to chat with you but I like these letters. I think it is romantic for you to come home from work at 3 or 4pm to a letter from me leaning on the bedside stool. So I heard you got a letter from that short man who pretends to love you. Found it in the bin when I was doing spring cleaning. Somehow we missed it in the mail (even though I suspect that your uncle or one of our workers, trying to shield you from him, must have binned the letter.) If it wasn't that the letter was dated September 2016, I would have called him a copy cat who sends letters to you because I am sending letters to you. Maybe he thought you weren’t going to come back. Who knows. I laughed a lot when I read the letter and I am sure you would too. But since you are busy and really we don't have time to spend on that man, I will just give you the highlights so we can giggle together. First off, I believe he has been eyeing this home of ours. He wants to replace you and thinks that somehow if he comes as the friend of my darling he can dance his way to my heart. You know those men who say oh I am your husbands close friend, then tries to touch you inappropriately when your husband is not looking. He believes that you may not be able to take care of me for much longer and thinks that perhaps it is time to start coming close. He basically says that all of your workers and colleagues either lack humility or are stupid. I do not disagree with him, it is just that I thought as a man who has no humility himself I thought this arrogance would be a quality he cherished. It is like a Nigerian restaurant owner hating the smell of egusi soup. While we are on the issue of humility and your workers, why is one of the gatemen refusing to wear the uniform of the security company he works for? We know Hammed is an old soldier but he should not be proud. He agreed to man one of our gates and he should do his job properly. We can’t have other security men wearing their uniforms and Hameed acting like he is too big to wear a uniform. We are not interested in how he feels about the uniform. If he wants to man that gate he should not embarrass us. So the letter reminds me of one of my own concerns. The grass cutter guy. Your secretary. I know you have just returned and all but really darling, are we just going to let him continue acting as your secretary after he has stolen our money? We have all the papers that show that he lied and personally profitted from an errand that we gave him. If we do not handle this matter soon, other workers may think we are soft and try to steal from us too. Ehen, before I forget, the guys who help us interview our staff say that the guy who we wanted to employ to check if any of the workers have committed fraud keep insisting that he is unfit to work for us. And you know we engaged them because this is how we have agreed to run our house: professionally and democratically. If their consensus is that he is untrustworthy, shouldn't we just look for someone else? I heard that one of the security men sent a letter to say he heard the man is a thief. We do not know. There are many other fish in the sea. (But I don't want you to use that saying for me o! In your life, I am the only fish in the sea. In fact I am the only living creature). But wait o, this one that I am explaining this letter to you, maybe you have even read it. Have you read the letter and decided it wasn't worth your attention? Or did those your PA’s destroy bin it before it got to you? Now I am worried. Because if you have not read it how many other letters and memos have disappeared? Let us be careful o. That is how overzealous staff will make us lose letters. I just want to say that I am here for you anytime. I don't care what the doctors say, you will always be my only true love. That guy who wrote that letter may have said some things that are true (except the funny part about humility, who is he trying to kid? Look how he treats the people who send him letters. He attacks them or tries to get them arrested or jailed. Petina.) but look he just wants to find his way to my heart. And how do you even begin making moves on someone’s lover when they are still around. You will recover fully my love and our love will grow stronger. Ps. Please this is another reminder about the grass cutter. Fire him please. it annoys me to see him everyday pretending like he is a clean godly worker. Pps. There is fura in the fridge in case you want something before I finish cooking. If you hear your ears ringing it is the sound of me crying out in jubilation at your return Bubu. If you feel tremors beneath your feet it is me pounding the ground in a happy dance. If you hear uncomfortable squeaky sounds it is me, moving things around in the other room as you settle in this weekend. Thank you for reading my letters and for deciding to come home Bubu. I know we can’t resume our relationship like it was before because you have to rest and all. I am patient. Your deputy will take care of the house this weekend while I watch you and take care of you. Some wicked people are suggesting that if, even after your return you still need your deputy to take care of the house while you rest may be I should look for another lover especially as I am still young and healthy. They say that it is not your birthright to be head of this house. They point to Europe and America and say that if we were there you would have just retired and asked me to find a younger healthier person. I just want to say that you should not allow any of that talk bother you. I am here for you because I know that you came back for me. Our house has continued suffering recession and really some of your houseboys have gone wild and crazy but I know that you suffered more than we all did while you were in London. Especially the food. We both know that one of the main reasons why the British thought it necessary to violently invade 25% of the world is that they could not bear the thought of one more year with their own horrible food and weather. And to think you spent almost two months there. I hope you were able to get some edible Halal food. No wonder you lost so much weight. The illnesses are bad enough then add tasteless meals to that. No. Your suffering was greater than ours. If you ask me the next time you have to go back to London, we should go together and pack some soup ingredients so I can cook for you in London. But if you just want to rest without me, I understand. In that case I would recommend that you travel with one cook from Abuja. I know some have suggested that you build hospitals that you can feel confident enough to attend here in Nigeria, but sometimes the body needs that feeling of traveling abroad to respond to treatment. Also those people speaking are just haters who wish you ill anyway. It is not your fault that we do not have stable electricity. Do they want electricity to go off while you are doing a medical procedure? They wish you evil those people. Meanwhile, now that you are back Bubu, I will make a list of all the people who must have skipped your mind, including the grass cutter who is really bringing shame to our house. Not just the size of his belly but the fact that he diverted our money and everyone thinks he is a thief. We shouldn't have thieves parading confidently in our yard. Also, can we talk about how all your workers just think they can use our security guards like their personal property? I thought they were professionals. We cannot have workers who have private disputes with their lovers then use our security guards to settle it. You know that one who calls himself Apostle in our backyard? That is how he got some of the guards to detain a woman on whose back he was ejaculating. For three days they held her without charge. Imagine. As if our guards had nothing better to do. But that bald headed self-styled Apostle, you would not even imagine he was that imaginative, to finish off on the woman's back. I wonder if he does that with his own wife. Where do people learn such things even? Anyway, better the back than the face or hair. No? Let me take hot water into the bathroom for you. I know you have a hot shower but we both know that it is more romantic for me to put water on the fire for you. Also, what if there is no electricity. Take your time in the shower and call out if you need me. Ps. I trust that now that you are back we will resume communicating like the happy couple that we are and that you will not allow your uncle or whoever is around you come between us again Bubu. Pps. I heard that short man who claims to be your friend didn’t even come to the airport behind his house to welcome you back. I hope he has a good excuse, like being very far away. Otherwise it might be because you embarrassed him that last time he came to greet you. You know how he likes to keep a grudge. So petty that small one. We should call him Petina. I have gone through my last three letters. Meticulously. Underlined every word. Went back to check for words with multiple meanings. Because I am thinking maybe it is me. Maybe I am the reason you are not responding to me, not talking to me. Maybe the letters annoy you. Maybe it was the typos in at least two of the letters. I know you are a meticulous man and I can understand how a typo can irritate you so bad you do not want to love me anymore. I apologize for any typos. But man proposes, God disposes — you do believe that every event is destined by God no? Or maybe it was because I called you General? So I am not taking any chances now Bubu. I only called you General because your love makes me stand erect, at attention. Ok, maybe you don't find that funny and I apologize. However I need to talk about something else. I am hurt. Deeply. Your friends told me that you spoke to the King of Morocco. Morocco! He called you. First that means that he has your number. I know he is a head of state and has contact with the presidency and all, even visited Abuja but, how did he get your number in London? How long has this been going on? And why the King of Morocco? He is not even your type. I have lived long enough with you to know what turns your head and no, Mohammed VI is not it. What did you see in him that you did not see in me? Ok, I have dropped the demand that you call me via Skype. Maybe you are self conscious and do not want me to see your face. But at least WhatsApp. Write me. Speak to me. Not through that houseboy of yours who looks like a pigeon. Ok, let me stop, I am getting angry. Let me simply explain to you why you speaking to Mohammed VI hurts me. First off the King of Morocco is not like you. You didn’t inherit anything and I know you loved me because I worked hard from scratch and am not a daddy’s boy. 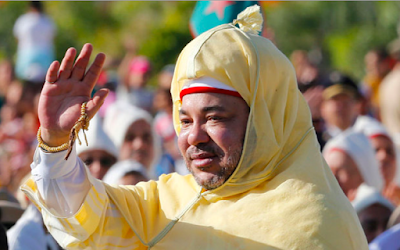 Mohammed VI is only king because his daddy was king. You built your name from scratch. You fought in wars. And you admired me because I was in some small way like you. You love hard workers. On the day of his birth, Mohammed was appointed Heir Apparent and Crown Prince! Is that the kind of person you want to be having an affair with? Someone who does not know anything about work? Is this the kind of person you are refusing to talk to me for? Yes he may have developed Morocco a bit but he also has been accused of corruption. But more than that Bubu dear, he put on weight since becoming king. I have been here trying all sorts of diets (remember the year I stopped eating meat altogether? Yes it was because of you!). I have been trying to work out because look at you my dear — so fit. You haven't gained a kilo since you took power after that coup in the 80’s. No belly fat. No flabby arms. Is that what you want? Do you want me to put on weight? Because I can do it for you. If that will make you speak to me directly, I will. For you I will. People keep repeating it. That it is better for me if you are away because your deputy is running our house well. But your deputy can’t love me like you do. And all he is doing are things you wanted to do anyway. There is nothing special about implementing your ideas. They are still your ideas.The men are all lining up outside our bedroom trying to take your place. I see them and I am refusing to even leave the room. If only you would speak to me and tell me what was going on I would be proud and tell those men wanting to replace you that although my man is ill and away, he is still my man. I am sorry to keep returning to this but man, the King of Morocco? I thought you like me tall dark and handsome. So yes he is richer than me and all but money isn't everything. And it is not even as if you like money. This is one thing that attracted me to you in the first place. You didn’t care that I wasn't rich. You just wanted to love me. Please, talk to me. Even if it is just for five minutes. Send me an emoji or something. Anything. Ps. Your uncle is refusing to give me any information and is making it hard for anyone to reach you. I am beginning to suspect that he is intercepting my messages and destroying them. I would hate to think he is keeping you from me. This is why if you can read any of my messages, you really need to respond to me. Otherwise, we may need to do something about your uncle. I am here whenever you choose to talk. Because love is patient. Pps. I just Googled Mohammed’s photo again and it just hurt me afresh. Is this really what you want Bubu?